In an era of tremendous gains by the extremely wealthy alongside pretty much flat gains by poorer workers, Edwards call for a repeal of Shrub's tax-relief for the wealthy makes perfect sense. It's interesting to see even so-called left-leaning papers like the L.A. Times describe Edwards' platform as risky and radical. Edwards, we are told, would face anger by the maligned constituency. Who are we talking about? People who make more than 3 or 4 million a year and own islands in the Bahamas? There must be more of these people than I imagined. Or at least more of them that own newspapers. Rapier has reached the same conclusion I've preached for years: We need to develop the technology we need to shift to electric power for transportation. Of course the disadvantages are 1). The costs for solar are still relatively high; and 2). We have a liquid fuel infrastructure. But in the long run, I don't see that we have any chance of maintaining that infrastructure. If we are to embark on a Manhattan Project to get off of our petroleum dependence, we should direct our efforts toward an eventual electric transportation infrastructure. Biomass energy will eat up too much land and agriculture will generate too much pollution with a poor ratio of Energy Return On Energy Invested (EROEI). Synthetically created photovoltaic materials will convert sunlight to energy far more efficiently than plants can manage. This fact might one day enable nanobots to outcompete DNA-based life. But for the foreseeable future the use of photovoltaics instead of biomass energy will protect nature. Airplanes probably aren't going escape their use of liquid fuels when cars shift to electric power. So the relative cost of air transportation will rise vis a vis ground transportation. But overall the cost of transportation will fall once we can power vehicles off of electricity. "Because we have people up there in Congress with the brain of a 2-year-old who don’t know what they are doing — they don’t experience it. I challenge the president or anyone who has us for 15 months to ride alongside me,” Vassell said. “I [would] do another 15 months if he comes out here and rides along with me every day for 15 months. I’ll do 15 more months. They don’t even have to pay me extra." America must urgently begin deploying from Iraq and take the fight more effectively to the enemy's home by destroying al-Qaida's leadership along the Afghan-Pakistan border. Al Qaeda was initially formed with backing by the CIA beginning with Carter, and about the only reason anyone anywhere remembers the group is that Shrub has spent his entire two presidencies assuring the world that Osama has all the resources, power, and charisma of Beezlebub himself. And now we're supposed to leave Iraq and turn our attention to the Afghan border? Obama! Afghan doesn't have oil. No one cares about it. You need to go back and take Geopolitics 101. If the U.S. sends its entire army chasing after one feeble Saudi rich-kid and fails to find him, we're going to make this guy into a hero for decades. Twenty years from now, they'll be selling Osama t-shirts on the LA beach front and writing movies about his daring escapades. Forget about appealing to Joe-5-pack. Joe won't vote for you anyway. Is all of this really necessary? Could the money be better spent rebuilding some innercity school or something? Or better yet, why doesn't the FBI simply pay us all if we agree to record our conversations and then turn them in at the end of each month. That way we can do away with the middleman. ABC: A proposed new FBI program would skirt federal laws by paying private companies to hold millions of phone and Internet records which the bureau is barred from keeping itself, experts say. The $5 million project would apparently pay private firms to store at least two years' worth of telephone and Internet activity by millions of Americans, few of whom would ever be considered a suspect in any terrorism, intelligence or criminal matter. The project would involve "the development of data storage and retrieval systems...for at least two years' worth of network calling records," according to an unclassified budget document posted to the FBI's Web site. The FBI did not respond to requests for comment for this story. The Washington Post reports today that Attorney General Alberto Gonzales made false statements to Congress while testifying about the Patriot Act. In his testimony, Gonzales claimed that "there has not been one verified case of civil liberties abuse," after being sent at least six government reports in the months preceding his testimony documenting extensive legal and procedural violations of the law. This is why we don't need the Patriot Act or other legislation that gives the government free reign. Americans need to have a proper fear of government operations that take place away from the public eye. We can't trust people just because they have the right faux accent or process faith in the right church. BEND, Ore. - Last weekend, Kent Couch settled down in his lawn chair with some snacks — and a parachute. Attached to his lawn chair were 105 large helium balloons. With instruments to measure his altitude and speed, a global positioning system device in his pocket, and about four plastic bags holding five gallons of water each to act as ballast — he could turn a spigot, release water and rise — Couch headed into the Oregon sky. "When you're a little kid and you're holding a helium balloon, it has to cross your mind," Couch told the Bend Bulletin. I must confess . . . this has crossed my mind. Couch is the latest American to emulate Larry Walters — who in 1982 rose three miles above Los Angeles in a lawn chair lifted by balloons. Walters had surprised an airline pilot, who radioed the control tower that he had just passed a guy in a lawn chair. Walters paid a $1,500 penalty for violating air traffic rules. I think they teach that BB gun technique in Oregon flight schools. Couch said he could hear cattle and children, and he said he even passed through clouds. "It was beautiful — beautiful," he told KTVZ-TV. He described the flight as mostly peaceful and serene, with occasional turbulence, like a hot-air balloon ride sitting down. Brandon Wilcox, owner of Professional Air, which charters and maintains planes at the Bend airport, on Thursday confirmed Couch's flight. Wilcox said he flew a plane nearby while Couch traveled, and a passenger videotaped the flying lawn chair. "I know he'd be thinking about it more and more, it would always be on his mind," she said. "This way, at least he's fulfilled his dream." 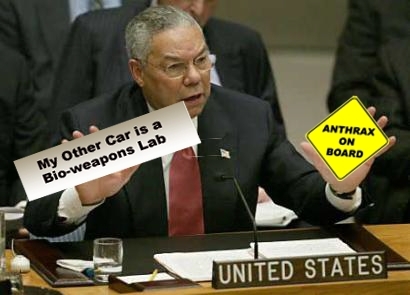 It now appears that Powell's very "creative" discussion of the "facts" at the UN and his tireless push for war were really a charade. All along, he was actually trying to talk the prez out of going to war. All I can say is, Colin, go home. It's bad enough to be a liar; don't be a clown.
. . . perhaps it is time for the left to put to rest the nonsensical slogan, “Support the troops, bring them home.” It is true, as crafters of this slogan have been at pains to point out, that the other side makes precious little sense either. Supporting the troops by not anticipating the dangers, waiting years to adapt Pentagon procurement practices so that they’re equipped as well as possible, and having psychologists deny them rights to combat-related disability benefits because of claims that their PTSD actually results from when their parents didn’t take them to the circus is not exactly in accord with the vernacular definition of “support.” I wouldn’t deny this. But I think their version still makes more sense than the antiwar movement’s version.“Support the troops, bring them home” sounds a lot to me like “Support the policemen, make sure they don’t have to fight crime” or “Support the ballerinas, keep them from performing dangerous dance steps that could lead to serious joint injuries.” If your daughter was a doctor fighting, say, a malaria epidemic, would you be “supporting” her by trying to get her called away? Of course, it is true that, unlike said doctor, many of the soldiers want to leave. Do you mean “support the soldiers’ wishes?” Do you really think decisions about war and peace should be made by polling the military? I imagine not. For whatever reason people join the U.S. military, the truth is that it exists to fight wars abroad. If we fought lots of noble wars abroad from disinterested humanitarian motives and nobody was killed (except, of course, for “bad guys”), and the countries we bombed were transformed into Sugar Candy Mountain, then perhaps that would be a noble goal. As it is, the last war we fought in which our participation was unequivocally a good thing (with lots of horrors embedded within it, of course) was World War II and at the start of that war we barely had a standing military. The purpose of the war machine created since then is not to defend what George Bush likes to call the “homeland.” Before 9/11, about 8% at most of the military budget was spent on anything potentially related to “defense.” The Army’s Northern Command was created only in 2002. A telling anecdote of Richard Clarke’s: in 1993, when the World Trade Center was bombed, a Naval attaché assisting him was unsure whether domestic attacks were part of the purview of the National Security Council.The muddled thinking embodied in this slogan is like that at the New York Times, where the editorial staff not long ago managed to say that, although Bush’s occupation of Iraq was clearly a terrible idea, we need a larger army. What do we need that army for if occupations are a bad idea? They couldn’t say. The war in Iraq is not about to end soon, but it’s already time to look forward and consider the lessons we learn from it, as a nation. The story of the war has been told by a group of liberals for whom this is the one aberration from America’s exceptionalism: the one time we struck first, the one time we used torture, etc. When we use their language in order to be accepted, we forfeit our ability to tell a different story. The price of our intellectual liberty is eternal vigilance. Organic fruit and vegetables may be better for the heart and general health than eating conventionally grown crops, new research has found. A ten-year study comparing organic tomatoes with standard produce found that they had almost double the quantity of antioxidants called flavonoids which help to prevent high blood pressure and thus reduce the likelihood of heart disease and strokes. Plants produce flavonoids as a defence mechanism; they are triggered by nutrient deficiency. Feeding a plant with too many nutrients, such as inorganic nitrogen commonly found in conventional fertiliser, curbs the development of flavonoids. The lower levels of flavonoids in conventional tomatoes were caused by “over-fertilisation”, the research team concluded. So eat your organic veggies before biting into that organic apple pie!